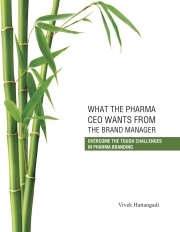 Description of "WHAT THE PHARMA CEO WANTS FROM THE BRAND MANAGER: OVERCOME THE TOUGH CHALLENGES OF PHARMA BRANDING (Edition III)"
The Chinese bamboo tree is amazing. Like any plant, the Chinese bamboo tree too requires nurturing. You take the trouble to create the right environmental conditions for its growth. You give care and attention. You don’t allow the roots to become crowded. Yet, in its first year, you see no visible signs of activity. You do not see any growth above the soil. The second year you water it and fertilize it and nothing happens. The third year too you water it and fertilize it and nothing happens. How frustrating! Your patience is tested and you begin to wonder if your efforts nurturing and caring for it will ever be rewarded. And finally in the fifth year, behold a miracle! You see its growth. And what growth it is! The Chinese bamboo tree grows 80 to 90 feet in just six weeks! This is also true about brands. Parle-G did not become a strong brand overnight. Neither did Tata or Amul. But give this story serious thought. Does the Chinese Bamboo Tree really grow 80-90 feet in six weeks? Was it dormant for five years? Little would you know that underground a huge root system and foundation was growing, year after year. It was actually developing a root system strong enough to support its potential for outward growth in the fifth year and beyond. Brands are not built overnight. A lot of the brands have taken 20 years or even 90 years to earn their status. ‘Brand Nurturing’ is required. You, as the brand manager, have to care for your brand like a living thing. Nurturing is necessary to make sure your brands have strong roots that lead to strong growth. Keep watering your bamboo tree. Vivek Hattangadi has been associated with the Indian pharmaceutical industry for four decades, having completed exactly forty years on 15th March 2014! He has worked at every level: medical representative, product manager, training manager and head of sales and marketing. He has been a practising brand manager since 1986. Having worked both in sales management and brand management, he is able to empathize with the field force when preparing brand strategies. While building some great brands, he has been able to influence the field force so that the strategies of the brand management team are executed at very high levels in the field. His strategies have been pragmatic and down to earth. He realizes that today’s market is ruled by short-term or immediate financial gains, creating barricades for the long-term process of brand building. And brand building in the Indian pharmaceutical context is healthy prescription generation. Apart from being closely associated with the industry, Vivek Hattangadi has also turned towards academics. He has played a vital role in designing the curriculum and the syllabus for the MBA course in Pharmaceutical Management of Vidyasagar University, West Bengal. He is also a visiting faculty in many business schools. He presents the expectations of the pharma CEO and what he/she expects from the brand managers in very simple language. Reviews of "WHAT THE PHARMA CEO WANTS FROM THE BRAND MANAGER: OVERCOME THE TOUGH CHALLENGES OF PHARMA BRANDING (Edition III)"